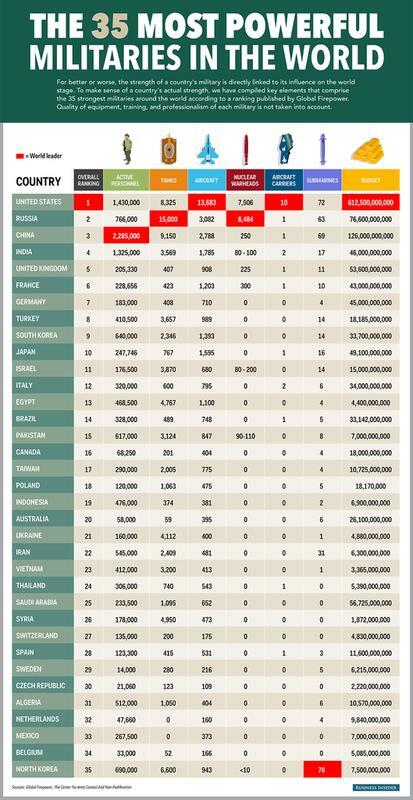 Global FirePower Index ranked the top 35 militaries in the world according to 50 factors, which include overall military budget, available manpower, and the amount of equipment each country has in its respective arsenal, as well as access to natural resources. Note that the index focuses on quantity, ignoring significant qualitative differences — North Korea's 78 submarines, for instance, aren't exactly state of the art. **This ranking involves a complex set of data that is subject to ongoing adjustments and corrections.